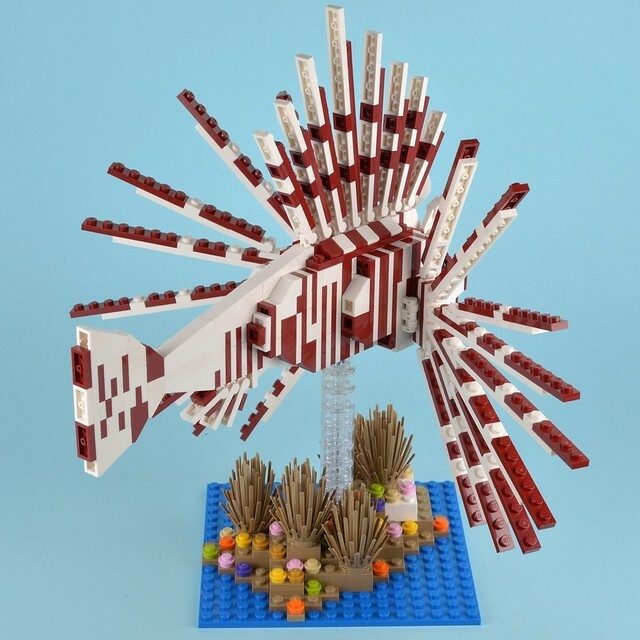 Last month, we mentioned that British company Tropical Marine Centre has produced a range of fifteen custom LEGO models of tropical fish, in conjunction with Bright Bricks. They are now widely available from Maidenhead Aquatics both in-store and online in the UK and are also now being stocked by Chowren Toys, who can ship them to countries outside of Europe. 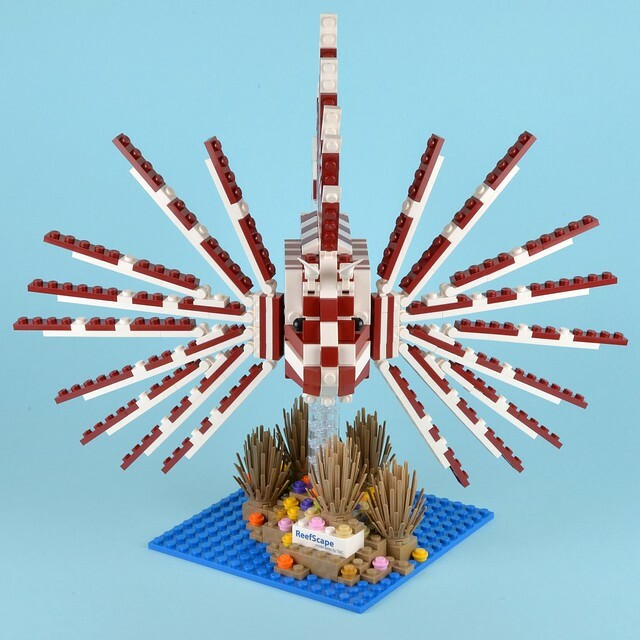 Just before I went away, Paul from TMC kindly arranged for one of the larger models, the Lionfish, to be sent to me for review. I’ve just finished building it and I have to say, I’m impressed, so much so that I hot-footed it down to my local MA branch this morning to buy another in the series. They come packaged in large glossy boxes which have both shrink-wrapping and plastic seals. The initial impression is of a high-quality product. 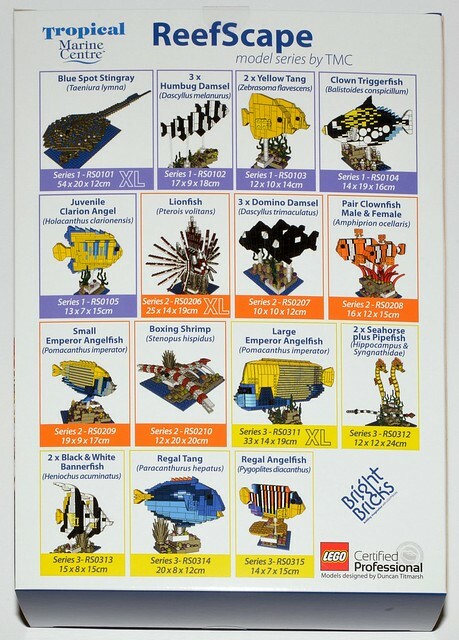 The back shows the current selection of 15 models along with the LCP logo in the corner which is the only place the LEGO logo appears. 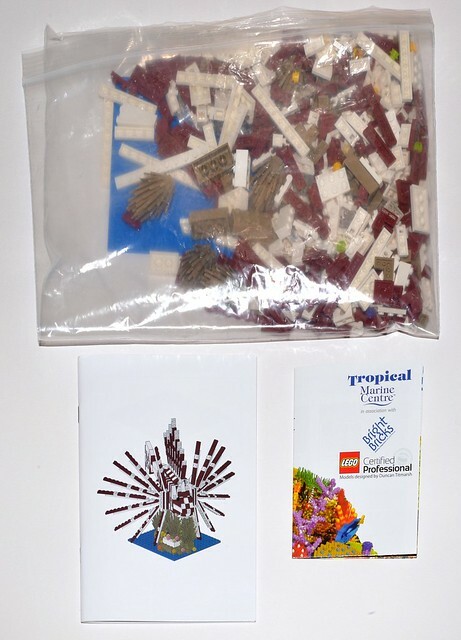 The side of the box has various disclaimers on it including how it’s not endorsed by the LEGO group and that they are not interested in any problems you might have with it. Presumably this is a requirement for sets produced by LCPs. Inside the box is a large zip-lock bag of parts, a printed instruction manual and a fold-out poster. 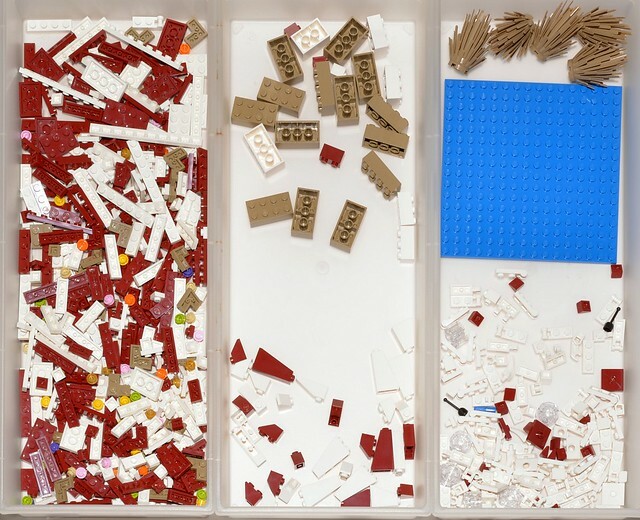 Clearly a single pile of all 619-pieces would make it difficult to find parts while building, so I sorted them into plates, slopes, bricks and everything else. The bulk of the parts are, as you can see, white and dark red 1xn plates. The instructions are printed on high-quality paper stock. The A5-sized 56-page manual contains clear and concise instructions for the fish with each step showing the parts to be added. The base is made first and it’s perhaps the fiddliest part of the build, particularly if you want to place every 1×1 plate exactly where shown. There’s no real need to do that, of course. 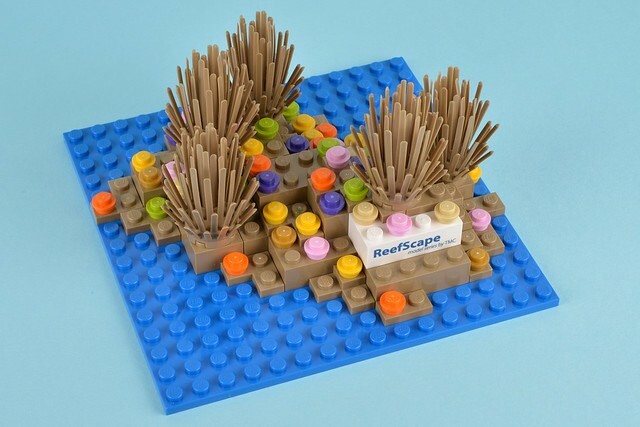 The 2×4 ‘ReefScape’ white brick is printed, by Minifigforlife, I suspect. The instructions for the fish are easy to follow and the approach taken to the build, which is basically to start at the tail and work upwards linearly layer by layer, works well enough although I felt sub-assemblies could have been used to advantage when adding the spines: it was fiddly to build them while they were attached to the animal’s body. There was one minor mistake in the instructions but nothing that would cause confusion. The body is made almost entirely of plates, with a few slopes here and there to give it the correct shape. 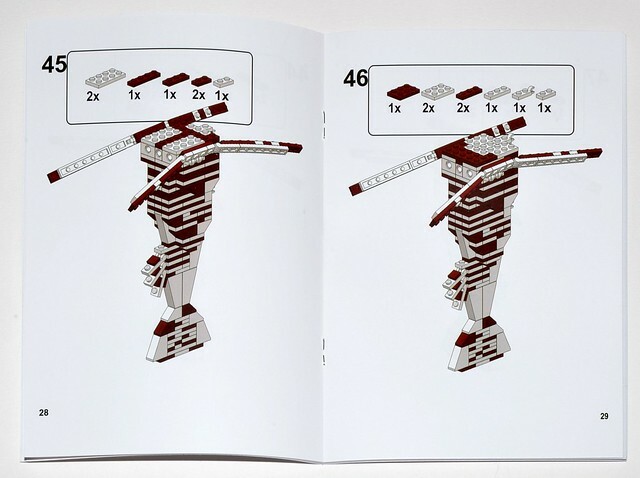 Thus it’s a fairy straightforward build although you’ll benefit from having a good bright light to view the instructions under because the black borders of the dark red plates were sometimes difficult to make out. The finished model is very impressive indeed. I’m no fish expert but it appears to be a good representation of the real thing. 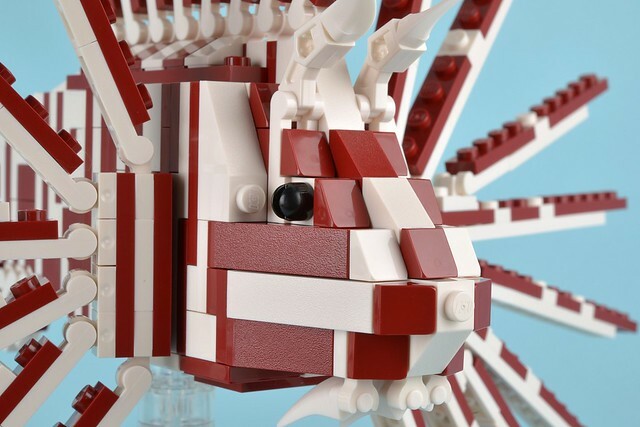 The wings/fins/tentacles/whatever on the side can be moved up and down individually and also folded close to the body. An ‘illegal move’ has been used for the eyes which are the base of levers. Six 2×2 trans-clear round bricks are provided to mount the fish on the base although I felt that wasn’t quite enough to keep it from touching the reef so I added a few more. This is a high-quality kit with good attention to detail to the packaging, the instructions and most importantly, the parts. I had none missing and a few small plates left over. Building it was very enjoyable and unlike making official models: no concessions have been made to make it easy by adding odd-coloured bricks inside it, by restricting the number of different parts or colour-keying certain parts, so it could be quite a challenge to those used only to official kits. The finished model is very attractive and, at about 25 x 14 x 19cm, impressive in size. 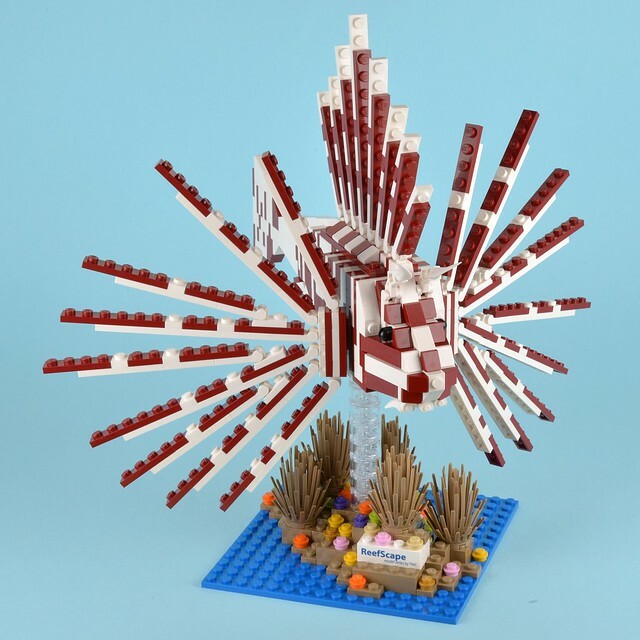 It’s something that every tropical fish loving LEGO fan will love to build, to own and to admire. The only sticking point is the price. At a penny under £100 this is not a cheap kit or a cost-effective way to buy parts, given they work out at about 38p each. 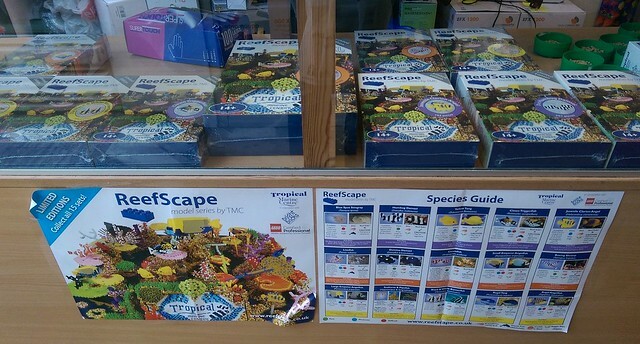 It’s not something the cash-strapped LEGO fan should even consider buying. 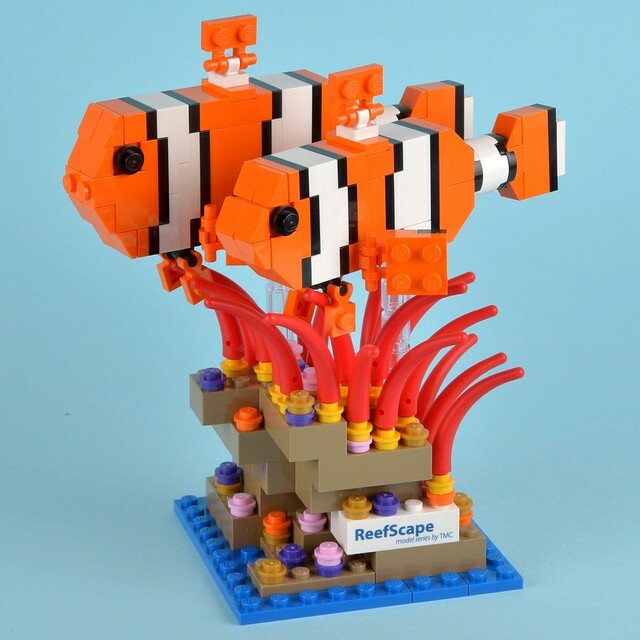 Instead, head to the ReefScape website and download the inventory and instructions and build them from your own parts. 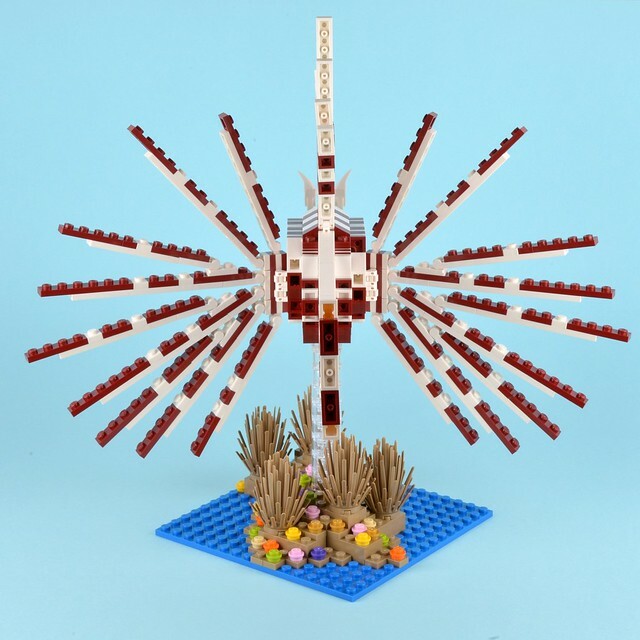 But, for those that have everything, one of these kits would make the perfect Christmas gift, and for the tropical-fish-loving money-is-no-object LEGO fan they are a match made in heaven. 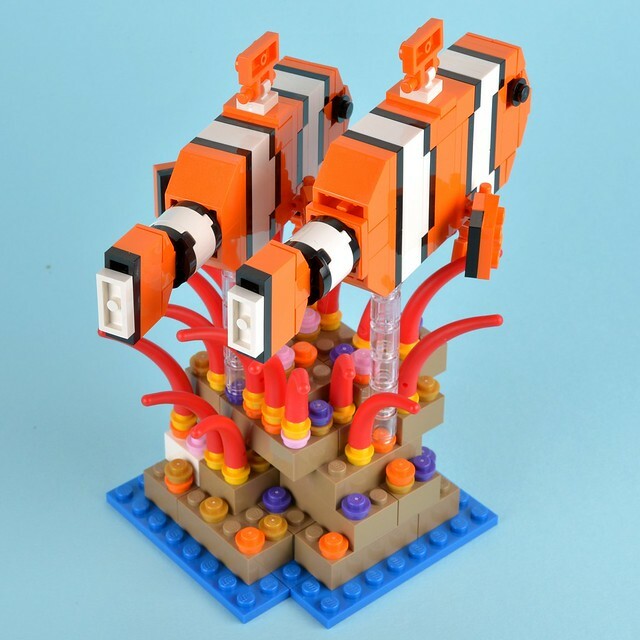 The clown fish set contains some rare parts: the 1×1 round plates with hole in yellow, 1×1 orange plate clips and the red tails. If the price hasn’t put you off you can buy them now from Maidenhead Aquatics in-store and online in the UK and from Chowren Toys if you are outside of Europe (their agreement prevents them from selling them to Europe). 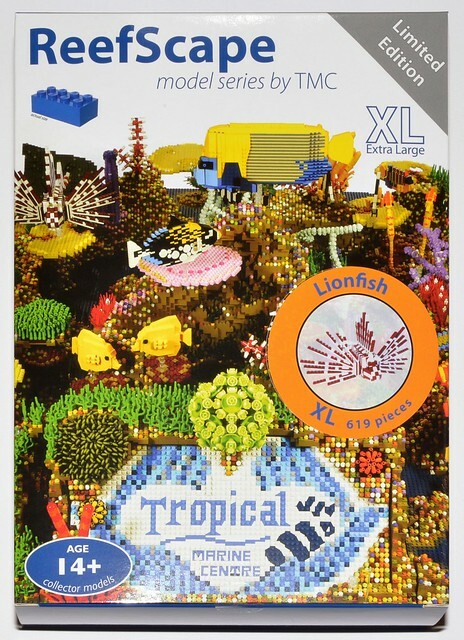 I understand that Duncan from Bright Bricks is going to add a tropical fish project to LEGO Ideas. I guess it could follow the success of Birds; let’s hope so!